Thinking about the New Year approaching, I want to encourage you to do something that you have always wanted to do. My younger sister, Brittyn, has always wanted to go sky diving so for her birthday this year she went. This wasn't something my dad necessarily agreed with but my grandpa (my mom's dad) was backing her up. He went sky diving for his 70th birthday. If sky diving isn't for you, like it isn't for me ha ha, then maybe it is a project that you want to begin. My parents and I have always wanted to turn our backyard into a relaxing haven. This past week we did a DIY on our backyard. First, we removed a stump by burning it and then taking an ax to it. Then, we leveled the ground as best we could to prepare for the stone fire pit. My dad and I stacked the stones and topped the fire pit with a top from a metal fire pit. My mom and I filled large pots with plants such as chard and decorative cabbage. My dad filled the areas around the pots with pine straw he raked from a friend's yard. Next, we painted the patio furniture with Rustoleum brown hammered textured paint and I painted the rusted fire pit top with Rustoleum black heat proof paint. We poured lava rock around the base of the fire pit and used decor pieces and pots for tables. My mom found the decor pieces and pillows from Ross and Dirt Cheap. You don't have to spend a fortune to make something look good. We are still adding more to the space like red square pavers around the fire pit so more pictures to come! Fuel up before you begin your project with my lightened up sweet potato-banana muffins. Great way to use leftover baked sweet potatoes or your leftover sweet potato casserole (if you use the casserole, reduce the sugar amount in the muffin). In another mixing bowl, mash the sweet potato and banana together until smooth. Beat in the egg with a whisk. Add the slightly cooled butter, whisking constantly. Whisk in the buttermilk, milk, agave, and vanilla until incorporated. I can't remember if I have given one of my other blog post with this title but those three words describe my Christmas. It is a spherification kit. Spherification is the culinary process of shaping a liquid into spheres which visually and texturally resemble caviar. This is the wikipedia definition of what the kit will do. I am very excited! I can't wait to start experimenting with it. My dad was excited about his Frogg Toggs (hunting rain suit). He has no excuses now. He is suited up and ready to get a big buck! This was just a few dishes of the many. On the menu- smoked ham, turkey, dressing, gravy, roasted parsnips, turnips, carrots, and rutabagas, carrot souffle, sautéed brussel sprouts, leeks, and green apple with candied pecans, hassleback sweet potatoes, and turnip green pesto with homemade rosemary focaccia bread. Sounds like a lot I know but we ended up having 21 people over our house. My oven was runnin and gunnin and so was I lol. I had a great Christmas! I am truly blessed! Listening on the radio this week to KLOVE, the radio show hosts have shared stories of people who have paid off other people's layway payments. One person paid 60 people's layway payments. How cool is that? I mean I was blown away when I heard that. I don't know many people who could afford to do something like this but thank the Lord for those who can. Do you take the time to put in change into the Salvation Army bell ringer's bucket? Have you helped out a family in need? I encourage you to do what you can to help others during this Christmas season. It isn't too late! My mom and I had the best time choosing jewelry, headbands, hair accessories, and more for two girls that we supported from our church's urban ministry this Christmas. In the years past, my sisters and I chose angel tree children to support. I always enjoyed knowing that I could make a child's Christmas special. A nonprofit organization that is close to my heart is Myasthenia Gravis Foundation of America. My dad was diagnosed with the neuromuscular chronic autoimmune disease, myasthenia gravis in January. It is an uncureable but treatable disease. When he was first diagnosed it was a very difficult time for my family. We got through the first couple of months through a lot of prayer. He has recently undergone surgery to have his thymus gland removed. He recovered well and is doing a little better. What we have learned with this disease is it to take it day by day. He has some good days and some bad days. By supporting Myasthenia Gravis Foundation of America, I can help increase research for a cure, increase awareness of the disease, increase support for those who have it, and more. 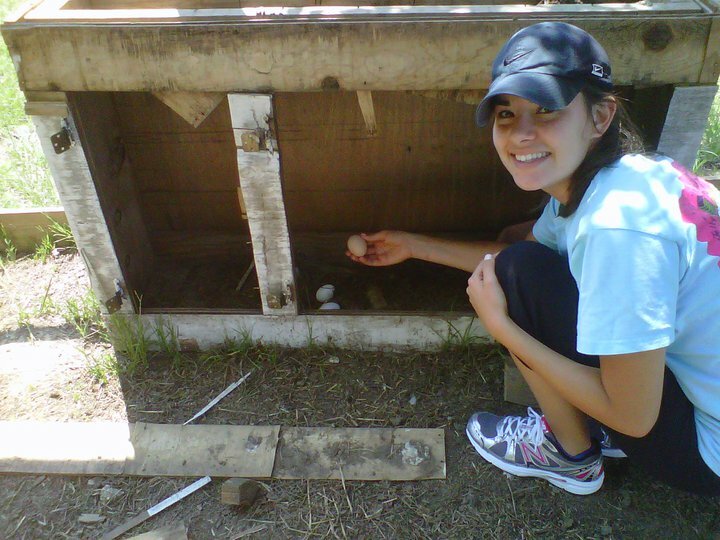 Do you have a charity that is close to your heart? Include your name and email address with your answer. I will donate to the randomly chosen person's charity. I will donate a dollar for every comment given on my blog to that charity. Spread the word to your friends and family to visit my blog to help make a big difference. I will choose on Christmas day. I hope you all have a very Merry Christmas! Remember Jesus is the Reason for the Season! Ahhhh! I don't have a Christmas present for ____________. Don't you worry because I have just the quick and easy DIY present for you. You can customize this gift for anyone; a child, boyfriend, sister, aunt, dad, friend, co-worker, etc. Caution! What you are about to read may shock you. 2. Choose the recipient and customize the Vent-A-Thought, Vent-A-Bling, etc. 3. If desired, paint the whole vent or paint designs such as words, polka-dots, etc. 4. Simply thread the ribbon through the slats of the vent. 5. Pull the ribbon through the skrewer holes at the top and the bottom. Be sure to leave enough ribbon length at the top to use as a hanger. Make a knot at the bottom holes. 6. Attach magnets to the back of the vent for another use such as displaying Vent-A-? on your refrigerator or filing cabinet. 7. So versatile! Use magnets to display pictures, messages, hang knecklaces, etc. Use mini close pins to clip recipe cards, pictures, etc. Ribbon is great for clipping pacifier holders, pinning brooches (jewelry), and securing notes. Hang the earrings on the vent slats. I want to help you quickly put this together so that you can gift it to your loved one or friend. Today's Question: Have you made a homemade gift for your friend, family, etc? What was it? My family started a new family tradition a few years ago. As my sisters and I got older, we didn't care to get up really early to open presents. Once everyone awoke we would all get in the kitchen to make a big breakfast. My dad mans the egg station with his famous light and fluffy scrambled eggs. My mom makes the grits and white gravy for the biscuits. Brittyn, my younger sister, cooks the bacon and I make the biscuits and anything else we decide to have that year. I am not that big of a breakfast eater so on a every day basis, I do not eat a big breakfast but I look forward to my family's Christmas morning breakfast. I have a fantastic muffin recipe that I created Sunday morning. I was craving a peach crumb muffin. My mom and I had an awesome one at a bakery in New York City. I decided I was going to recreate that muffin and I did even better. The muffin's moistness and light texture was a unique component because most muffins are dense. The crumb topping is crunchy and sweet. Yum! My peach crumb muffins would be a great addition to your family's breakfast. Maybe your family will want to join in my family's tradition of preparing a big breakfast on Christmas. In another mixing bowl, beat the egg with a whisk. Add the slightly cooled butter, whisking constantly. Whisk in the buttermilk, milk, agave, and vanilla until incorporated. Using a rubber spatula or wooden spoon, fold in three fourths of the dry ingredients into the wet. *Folding the ingredients in will help to produce a light muffin. Do not overmix! Add the peaches into the bowl with the rest of the dry ingredients. Toss to coat peaches. Fold the peaches and rest of dry ingredients into the muffin batter. Fill the 11 muffin liners with batter. To prepare the crumb topping, mix together the butter and sugar with your hands until incorporated. Stir in the flour, cinnamon, and pecans. Top each muffin with the topping. Bake muffins for about 20 minutes. Allow to cool for 5 minutes. Enjoy! The beignet mix and coffee will be a perfect addition to your family's Christmas breakfast! Today's question: What is your favorite breakfast item? Hi Yall sorry I have been away. The past week I have spent it with my family. My mom and I spent a few days helping my sister with John Michael, my nephew. Last Saturday, my parents, my sister, and I took John Michael to the aquarium. I know at 3 months he didn't really know what was going on but he did seem to like the pretty colors of the fish. The New Orleans's aquarium wasn't only John Michael's first time but also my dad's. The boys had fun! Any time my family and I are in New Orleans, which we is a lot now because my sister and her husband live there, it is our tradition to go to Cafe du Monde`. I grew up eating beignets there. Hot, lightly fried dough covered in powdered sugar is to die for. If the wind is blowing just right, it is inevitable that we will have powdered sugar all over us. Haha! My family and I love to wash our beignets down with chocolate milk. Don't worry I did bring you a souvenir from New Orleans. You can enjoy Cafe du Monde` beignets and chicory coffee from the comfort of your home. Today's question- What is one Christmas tradition you and your family have? This picture was taken at my bake sale I had several years ago to support Share Our Strength in their National bake sale campaign to help end childhood hunger. we grabbed lunch at a cafe called The Cheese Shop. Their oatmeal cookie was sooooo good! 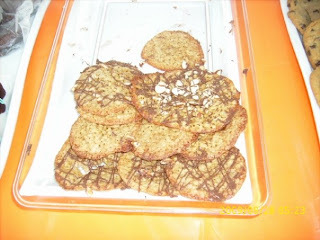 When I got home I was still dreaming of this cookie and that is where the experimentation began. I got into the kitchen to try to perfect that cookie. When I looked in our cabinet, we didn't have any rolled oats. All we had were some packages of oatmeal. I decided to be creative and use the dry oatmeal to prepare the cookies. The end result was perfection. I achieved the crunch on the outside of the cookie and the chewiness on the inside. I have made these for many different occasions. I like to decorate them by sprinkling sliced almonds and then chocolate drizzled on top or with just the chocolate drizzle. They are the best oatmeal cookies EVER! I have never shared this recipe with anyone so you are the first to know my secret! Shhh! In a mixing bowl, combine the melted butter and set aside to cool slightly. In another mixing bowl, combine oatmeal, both sugars, and salt. Stir the mixture together. Whisk together the cooled melted butter, vanilla, and egg. Using a large or wooden spoon, stir the oatmeal mixture into the butter mixture. Cover the bowl with plastic wrap and refrigerate for 20 minutes. Line a baking sheet with parchment paper or a silicon mat. Using a small ice cream scooper or small spoon, drop the chilled dough onto the paper or mat. Separate the dough balls a few inches from each other to give the dough room to spread. Flatten the dough balls slightly. Bake for 11-14 minutes or until the edges brown nicely and the center of the cookies are medium brown. (The cookies will continue to cook on the baking sheet). Allow the cookies to cool for about 5 minutes. Using an offset spatula, gently remove the cookies by working the spatula around the edges of the cookie. Decorate with sliced almonds and drizzling of chocolate if desired. Prepare these cookies and share them with your friends and family! I would love for you to share your favorite cookie recipes with me. My mission is to highlight the flavor of vegetables and not hide them into foods. I got to share my mission through writing an article for an Atlanta based magazine- Flavors. A healthy treat that the kids will love this Christmas is my Snowman Apple. Wash and dry apples. Secure sticks into apples. In a small saucepan over medium heat, melt peanut butter and honey. Stir to combine. Coat apples into peanut butter mixture and place on paper plates or squares of wax paper. Now let the kids have fun decorating their snowman. Place the marshmallow through the stick (this is his head). The rest can be up to the kids. Today's question- What vegetable do you not like but would be interested in trying prepared in a new way? Today's gift- I will create a dish using the vegetable the winner suggests. Do you like to entertain? I love hosting parties! I enjoy planning the menus then spending time in the kitchen preparing the food. For a holiday like Christmas, it is fun creating appetizers, desserts, etc. that are special to this holiday. I have made pinecone shaped and decorated cheeseballs and cheeseballs shaped like presents. 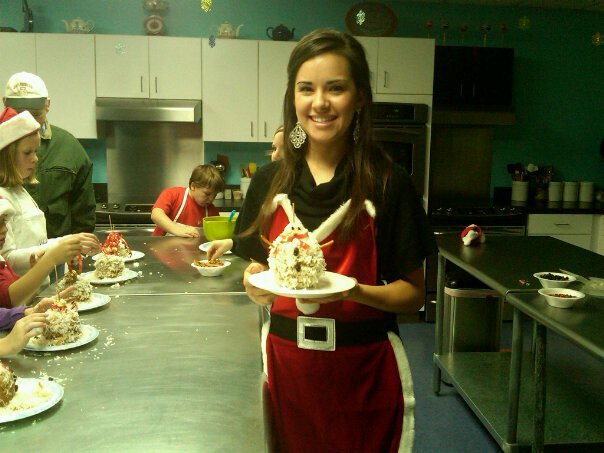 You can prepare cookies shaped like holly, reindeer, etc. Those are some fun ideas but if you want to present your food in a swanky (my definition- a little more upscale) way. Use creative serving pieces like serving dips in large martini glasses or soups in shot glasses. One of my favorite serving dishes is a cast iron skillet. This is not just a Southern thing! I had a meal served in a cast iron skillet to me in New York City. I love to prepare mini cast iron skillet chocolate chip cookies ala mode. For a less calorie ala mode topping, serve frozen homemade vanilla whipped cream on top. 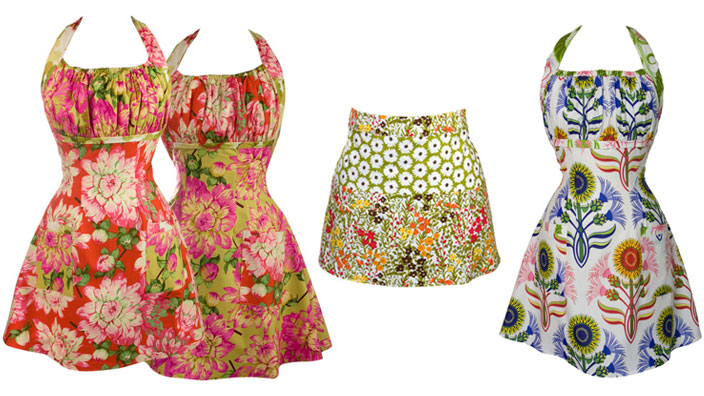 These aren't your run-of-the-mill aprons either. They are beautifully designed and they are also very special to me because on the tag is engraved the same scripture that I have in my cookbook which is 1 Peter 4:10. "Each one should use whatever gift he has received to serve others..."
Her aprons are also designed with not just looks in mind. She also wanted aprons that were comfortable and fit well. Cynthia's business is also mission minded. She works with an educational center for women in Kenya. Speaking of the hostess looking good as she/he cooks, she/he also needs to look good as he/she cleans. Today's gift is this festive pair of Santa cleaning gloves, great for cleaning all of those dishes from entertaining. Also included is this elegant wooden spoon glammed up with a sleek silver handle. Today's question- When you host a party, do you make it all my scratch or have it catered? Catered can mean grabbing foods from Sams and Costco. Do you need help with your Christmas shopping this year? I have an idea for you. Create a personalized gift for your friend, co-worker, or family member! This is also a great gift for the guy who has everything or who you don't know what to buy for, like my dad. My sister bought my dad one with the Boston Red Sox emblem and his name on it. My parents and I at the Boston Red Sox game at Fenway Park a few years ago! There are sports emblems, collegiate, hunting, and fishing designs available too! I have always loved to receive a personalized gift whether it was my initials or my name imprinted on a bag, cup, and other items. One of the personalized gifts that I carry around with me on every road trip is my Tervis tumbler. It was gifted to me by a friend as a thank you present. She not only personalized it by printing my name on the tumbler but also picked out a tumbler with me in mind. On Masterchef, I was deemed the pastry princess. My friend got this princess tumbler for me with that in mind. If you are not familiar with Tervis tumblers, what makes them unique is that they can hold both hot and cold temperatures for an extended amount of time. You can come back 10 minutes or so later and your glass of sweet tea isn't watered down. Condensation and sweating are reduced. I love this because if you leave the tumbler on a table, you won't find a pool of water when you come back. They are also microwave, freezer, and dishwasher friendly. I think this is the best feature! On www.tervis.com, first choose your design, tumbler shape & size like a mug, and if you want to personalize it with a name or message. Right now, Tervis has a special discount on their bestseller tumblers. You receive 25% off! Today's question- Have you ever received a personalized gift; what was it? Remember to include your name and email address with your answer. Today's gift- I will create a peronalized 16 oz. tumbler just for you! What helps start your day? Is it coffee or a coke? Does that burst of caffeine running through your body help give you energy? Well maybe I should have tried something to jump start my day in a positive direction. So it all began early this morning after I dropped my nephew off at daycare. I got back to my sister's house and quickly got dressed to go to my cookbook signing. I loaded up my vehicle with my purse and makeup bag then started my vehicle to warm it up. Before I ran back inside to grab a few more things, I pressed the "unlock" or so I thought button. This is where my day took a turn for the worst. I had accidently pressed the lock button. Ahh! I wanted to pull my hair out! So it gets worst because my phone was in my vehicle and there is no one that I could get to help me. The only thought that came to my mind was that I could go to the front gate at the base (my sister and her husband live on an army base) and get help. As I am waiting for the base's cop to arrive, I Tango my younger sister. Tango is awesome especially if you don't have your phone. After dreadfully waiting for what seemed forever, the cop finally showed up. Did I mention that my signing is in 30 minutes. The Lord was watching over me because the cop was able to open my vehicle and I was on my way. Have you ever had a day like this? There is a song by Francesca Battestelli called This Is The Stuff. Listen to this song, the lyrics are really good! "I lost my keys in the great unknown and call me please because i can not find my phone....This is the stuff that drives me crazy, this is the stuff that has been getting to me lately, in the middle of my little mess, I forget how much I am blessed...."
Music helps get me in a good mood. I think this would be a good start to my day. When I used to commute to school, I would listen to KLOVE, a Christian radio station, and it would really start my day off right. If coffee is your quick fix for jump starting your day, then I have the thing for you. My gift today is a $15 Starbucks gift card. Have you had a day like this? Share it with me in the comment section, to have your chance to receive this gift. Don't forget to leave your name and email address. I am asked a lot about how I came up with all of the recipes in my cookbook. Well it takes being inspired and having creativity. I get inspired to create recipes by experiences such as eating at a restaurant or talking with people about their favorite foods. I also get inspired from my favorite food combinations like sweet potatoes and peanut butter. I love both of the ingredients but would you really think about combining the two???? Well, one day I decided to slather peanut butter on my baked sweet potato instead of butter. I loved the flavor! So when I was working on my cookbook, I thought back on that flavor combination and knew that it could work in a dessert. And that is how my Sweet Potato Peanut Butter Blondies were born (created). These are perfect for gift giving! Preheat oven to 350 degrees F. Grease a 13x9-inch baking pan with unsalted butter. Sift together the flour, baking powder, salt, and baking soda into a small bowl. In a medium bowl, mix together the melted butter and brown sugar. Stir in the beaten eggs, sweet potato, peanut butter, vanilla, and cinnamon until combined. Add the flour mixture and mix well. 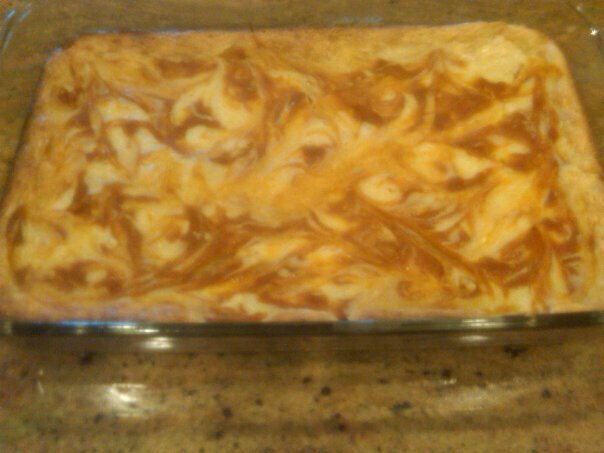 Spread the batter evenly in the baking dish. Bake for 18 minutes. Let cool for 10 minutes. Cut the blondies into squares or desired shapes. This recipe along with other great Southern inspired and entertaining recipes are found in my cookbook- Modern Hospitality: Simple Recipes with Southern Charm. My question and gift today go hand-in-hand. Question: What is your favorite flavor combination? The gift today is that I will create a special recipe for the winner using his or her favorite flavor combination. This year my mom and I wanted to be creative with our Christmas card. We decided to spell out family using objects from our kitchen to form the letters. The kitchen is the hub of our home. Friends and family love to gather around fellowshiping and having fun. I have always looked forward to holidays like Christmas because I love getting in the kitchen with my whole family as everyone has apart of preparing the feast. My dad's part is to carve the turkey. He also hovers over the condiment platter while Brittyn puts out black olives. He loves them! I like the little gherkins. 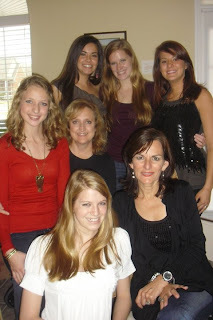 Leslie, my older sister, prepares the deviled eggs and Brittyn, the youngest, also decorates and sets the table. My mom and I team up with preparing the turkey, ham, and sides. My mom's specialty is preparing Great Grandmother Adele's cornbread dressing and giblet gravy. I usually handle the desserts. That is where I like to really show off. One year I received a creme brûlée kit with a torch for Christmas. I made creme brûlée, eclairs, and more that year. So my question today is What objects would represent your family? Be sure to include your name and email address with your answer. Today's gift is an e-gift card for Walmart worth $15 so that you can design and order your family's Christmas card to send to your friends and family. It cost me only $20 for 50 cards. On a regular basis, breakfast is not thought much of by my family and I. We usually grab yogurt, fruit, granola, cereal, or toast and are out the door. There are a few occasions where we give breakfast more attention and one of those times are on holiday mornings like Christmas. When my sisters and I got older and we wanted to sleep in versus get up early to unwrap gifts, my family decided that we would open presents and then have a big breakfast. This way we could enjoy the process of opening presents and visiting with each other, instead of rushing the process and jumping straight into the kitchen to prepare a feast. So we prepare our big Christmas meal at dinner. On our menu is usually biscuits and gravy, my dad's fluffy scrambled eggs, grits, bacon, and sometimes pancakes. My dad loves pancakes with blueberry syrup. We make our blueberry syrup by mixing thawed blueberries (we always have blueberries in the freezer from where we picked them in the summer) and syrup then heating it until the syrup is warm. This morning I woke up early and decided I wouldn't make my dad wait until Christmas morning to enjoy pancakes and his favorite blueberry syrup. No! I would make him some this morning. I had my pecan oil on hand and decided to use it in place of canola oil in the pancake batter. Pecan oil has health properties better than olive oil, canola oil, etc. and has a high smoke point which means you can cook at high temperatures with it. To me, the flavor isn't distinctive of pecans so you can use it for multiple uses. Do you say (syrup) seer-up or sir-up? No matter how you serve it, milk or white chocolate or hot or cold (frozen), I love it! The top picture is my mom and I at Vosges in Soho, NY having a hot white chocolate infused with lavender and vanilla. It was smooth and fragrant. Below that picture is me indulging in a frozen hot chocolate at the famous Serendipity 3 in New York.It was pretty delish but I will caution you that you have to spend like $9 a person on your total order. I think they have several people who have just wanted to come in for the frozen hot chocolate like my mom, sisters, and I. I would save the trip there and make it at your house. Ok so a little trivia or maybe it isn't trivia for you but it was new for me. Did you know that there is a difference between hot cocoa and hot chocolate? Hot cocoa is made from cocoa powder, sugar, and milk. Hot chocolate is made from melting chocolate in hot milk. I have always called it hot chocolate. I never said I want hot cocoa. So the question I am posting today is- Do you say hot cocoa or hot chocolate? Don't forget to include with your answer, your name and email. 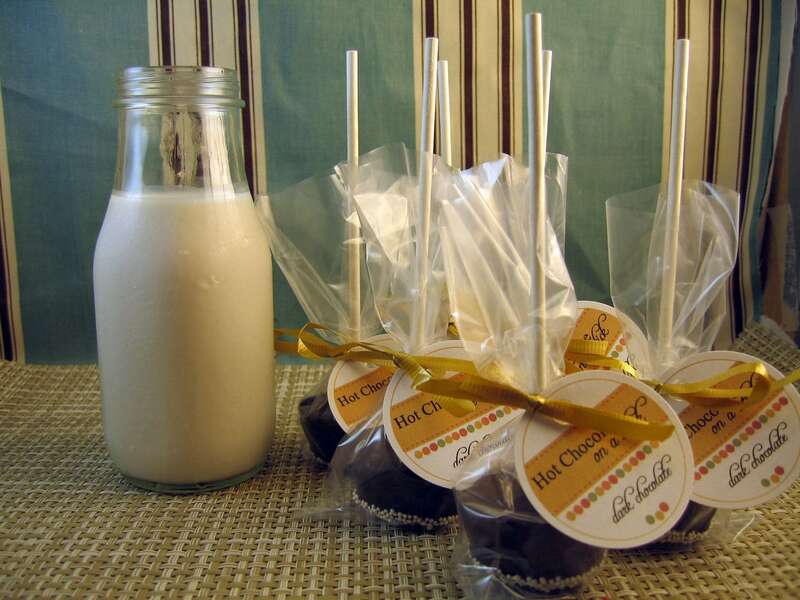 The gift today is Hot Chocolate on a stick from Sweetnuzz. It is a set of 6 variety package which includes milk or dark chocolate and flavors such as original, almond, and peppermint. Each are individually packaged which means you can enjoy one or two and gift the rest or keep them all for yourself. Haha! Serve homemade marshmallows with your cup of hot chocolate. Try my agave marshmallow recipe in my cookbook- Modern Hospitality: Simple Recipes with Southern Charm. My Christmas list every year has included cooking equipment and tools. My friends thought I was a little weird asking for things like a blender and stand mixer for Christmas. When I try to remember at what age my love of cooking began, I can't because I only remember always wanting to be in the kitchen. What I love about Christmas is that it is a time to think about others. I have been blessed with my talent for cooking and especially love using it during this time of year. I believe sometimes the best gifts are those that are handmade vs. store bought. The thought and time put into homemade cookies, candies, breads, and cakes take your gift to special level. Ok so maybe I am being partial because I love when my neighbors bring over a plate full of candies and cookies. I have a sweet tooth! Not all your Christmas goodies have to be full of butter and sugar though. 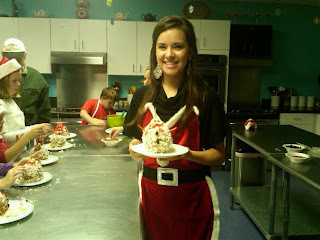 I gave a Christmas nutrition/cooking class last year to a group of kids. We made snowmen apples. These weren't your normal caramel apples. Instead of caramel covered apples, melted peanut butter covered the apples and then finished with an avalanche of coconut snow. The kids decorated their snowmen with pretzel arms, candy coated sunflower seed eyes, and raisin buttons. This is a guiltless treat for both young and old. To kick off December and the countdown to Christmas, I want to do something special for all of you. Beginning today, I am giving away a gift every day until Christmas. Your chance to win is easy. Simply either comment on my blog post or answer a question if I post it on my blog. Each winner will be randomly selected. Can't wait to hear from you! Please include your name and email address so that I can contact you! If you have an aunt or relative like my Aunt Guy (I'm not quite sure why we call her that but we do) then you understand how your life is never boring around him or her. Aunt Guy is care-free, confident, risk taker, and I could go on. Let me also add in that she loves karaoke. You will understand why I added that part in later. It is the night after Thanksgiving and my mom and I were pulled away from our Black Friday shopping, which didn't include getting up before the sun or beating anyone down to get a sweater that was on sale. We chose to shop at our favorite discount stores- Ross's, TJ Max, and Marshall's. So we were called to go eat dinner with my dad, Aunt Guy, and Wawa aka grandma. We met my aunt at my Wawa's house and piled into the car to go eat. My mom and I both looked at each other wondering where they had decided to eat. My aunt is at the wheel chauffeuring us to our unknown destination. After 20 minutes and signs that we had crossed over into Mississippi from Memphis, TN, we began inquiring about the restaurant. "Aunt Guy what is the name of the restaurant"- me. "Well I'm not sure but my friend recommended it to me." -Aunt Guy. That satisfied our curiosity enough for the moment until 10 minutes down the road she declares that she can't find the restaurant. After a stop into a convenience store for directions and a phone call to the restaurant, we got pointed into the right direction. You can probably fill in what my mom and I were thinking then. "Look for the restaurant its called Barbwire"- aunt Guy. I didnt even have time to process it all before we drove by a shack with a sign that read Barbwire Bar and Grill. We all looked at each other like I dont't think I want to go in. Aunt Guy convinced us to go in and give it a try. We open the bar covered door, walked in, and sat at one of the many open tables. A rendition of some country song was being sung by a girl with a microphone. I jokingly told my Aunt Guy I know why she wanted to come here because they have karaoke. She has been known in the past to bring her karaoke machine to family functions. If the surroundings weren't already a clue that we should get the heck out of dodge, we asked the bartender/waitress for a menu. She gave us a look like why?? then found a menu and handed us the piece of paper. We peered through the haze of the smoke filled room at the short menu of burgers and chicken tenders. My aunt chockingly explained to the waitress that her brother (my dad) has a breath problem (allergic to smoke) and we won't be dining with them this evening. We swiftly escaped from the table and headed towards the door. With the scarcidity of women in the place, one disappointed older gentlemen exclaimed "why yer leaving?" With one foot out the door and fresh air ahead, we didn't stop to reply. Needless to say Barbwire wasn't exactly what we had in mind for a family dinner. We all laughed off the experience and headed to our next destination that included a few turn arounds and dead ends along the way. Cracker Barrel never looked so good as we pulled up at 9:00 p.m.
As I reflect back on Thanksgiving and the dinner I shared with my family, I am thankful for the people God placed into my large extended family. I am thankful that we can laugh together and have a good time. "A cheerful heart is good medicine..." Proverbs 17:22. I pray we as a family continue to have many more laughs and good times. Thanksgiving has been one of my favorite holidays because it is centered around food, family, and fellowship. For my family, it has been a tradition for the past several years for my dad's side of the family to all come together. I love the almost 40 people family gathering. You know we have to have a lot of food to feed this many people. It is like a Sunday pot luck in which everyone brings their favorite side dish or dessert. We always have one of my aunts bring the turkey and one of my grandmas bring the ham. I have been contemplating this week on what I will prepare. I have decided to make a dish I created with brussel sprouts, one of my favorite vegetables. It is my Sauteed brussel sprouts, leeks, and green apple dish with candied pecans. Melt butter in a large cast-iron skillet over medium heat. Add olive oil and garlic and cook for 2 minutes. Add sprouts, leek, and apple slices to skillet. Season with salt and cook for 8-10 minutes. Gently toss vegetables during cooking time to coat in butter and oil and prevent from cooking on only one side. To finish, top with candied pecans and serve immediately. Over medium-low heat, bring water, sugar, and pecans to a simmer, stirring until sugar dissolves. Continue simmering for 7 minutes, stirring occasionally. Sugar and water should turn into syrup. Using a fork, remove pecans onto wax paper to cool. I am also going to be creative with my other new favorite vegetables- turnips and rutabagas. I am going to make my roasted rutabagas and turnips with walnuts and fried sage. Combine the rutabagas, turnips, and onion on a baking sheet. Drizzle walnut oil over the vegetables. Sprinkle sea salt over vegetables. Julienne 8 sage leaves and sprinkle over vegetables. Toss vegetables together to coat. Bake for 45-50 minutes, stirring a couple times during baking. Spoon the vegetables on a serving dish. Top the roasted vegetables with walnuts. For the fried sage, add olive oil to a sauté pan. Heat over medium-high heat. When oil is hot, place the sage leaves in the oil. Fry for about 30 seconds then remove to a paper towel-lined plate. Place the fried sage leaves on top of the vegetables and walnuts. Serve warm. This year I am very thankful and blessed to have such a wonderful family. I know this Thanksgiving will bring a lot more smiles and laughs. I know what I am preparing for Thanksgiving, do you? I want to answer all of your Thanksgiving day food preparation questions. I am going to be on my blog tonight at 9:00 p.m. Central time. You ask the questions and I will do my best to answer them. Can't wait to speak to you tonight! You should have seen the excitement on my face. Every time I am in NYC, I am on the look out for this truck. My first thought was "shucks we haven't eaten lunch yet". I have only eaten one of their waffles for dessert. I remembered though that Thomas Degeest (the founder/owner of Wafels & Dinges Truck) had facebooked me and told me about one of his waffle creations in which was inspired by his travel to Biloxi, MS. The waffle I am talking about is his BBQ Pulled Pork Wafel topped with coleslaw and a coolickle (pickle prepared in coolade). My mom and I were intrigued and decided to order that and their special of the day- Chili Con Carne Waffle. And don't forget dessert! We had their special which was Caramel Apple Waffle. It was good but it had me longing for their deThrowdown Wafel which is what Thomas competed and won with against Bobby Flay. It is a liege (special Belgium dense and chewy waffle) topped with spekuloos spread (gingerbread spread) and whipped cream. Just one bite will bring you back for another and another. It left me in euphoria! ha ha! Go find the Wafel and Dinges Truck! You won't be disappointed! Ok so I am really feeling like you need to be able to taste it too! Leave me a comment about what toppings you would love to have on a waffle. I will randomly select from the comments for one of you to receive a jar of Spekuloos Spread. Leave your name & email for me to contact you. You have until this Friday- Dec. 18th to leave your comments. What makes cooking and baking fun for me? How do you know what will work well with this recipe? I think of what it taste like which for me its a mix between a chess square/cheesecake. Then I think of the flavors I like and how I can infuse them into this recipe. I love nuts and chocolate. Well my love of chocolate went into over-drive so my first variation is a Chocolate Pecan No Name Bar which taste like a decadent brownie. My second variation is a Coconut Pecan No Name Bar which taste like a Magic Cookie Bar (graham cracker crust, coconut, pecans, and chocolate). For an elevated presentation, I cut the bars into triangles. To do this, simply cut them into squares and then in half diagonally. The bars can also be cut into circles. Serve this decadent Chocolate Pecan No Name Bar warm topped with orange whipped cream at your next dinner party or Thanksgiving dinner. To make crust: Mix the melted butter and sugar together in a medium bowl. In another bowl, mix the flour, baking powder, baking soda, salt, and cocoa powder. Add the flour mixture to the butter mixture and mix until combined. Stir in the vanilla. Spread the mixture into bottom of the baking dish. Bake for 5 minutes. To make the filling: Beat the cream cheese with an electric mixer until smooth. Add the eggs and mix until combined. Stir in the melted butter and vanilla. Stir in the confectioner’s sugar and cocoa powder and mix well. Stir in the chocolate chips and pecan pieces. Spread the mixture on top of the crust. To make the whipped cream: Beat the cream using an electric mixer in a large cold bowl until soft peaks form. Gradually beat in the confectioner’s sugar. Fold in the zest. Cover and refrigerate. To serve, cut the bars into desired shape and top with orange whipped cream. What are you going to prepare for your Halloween treats? One of the things that I love about fall is seeing nature's bounty. Pecans and pumpkins are some of my favorites that are plentiful this time of year. For example, my parents and I were walking near our house the other day and saw lots of pecans that had fallen from the trees and were just ready to be gathered. As I cracked some open with my hands, I discovered that it was like dipping my hand into a Halloween candy bag: sometimes pulling out a treat and sometimes a trick. For me, the treat would be a piece of chocolate and the trick- licorice which I do not like. But in this instance the treat was a meaty, delicious pecan and the trick was a dry, crumbly pecan. Pumpkins are not only for carving but also great in savory and sweet treats. For a simple yummy pumpkin dessert, I swirl spiced pumpkin puree in my No Name Bar batter. What are No Name Bars you might ask? Well they are a mix between a chess square and cheesecake. I call them no name bars because they are too good for words. Ha ha! Clever huh! One of the desserts found in my cookbook- Modern Hospitality: Simple Recipes with Southern Charm. For the swirl: Mix pumpkin puree and spices. Spoon two lines lengthwise of the pan, a few inches from each other. Using a knife, swirl the pumpkin into the cream cheese batter. For more Halloween treats, check out my other blog posts. My Grown-Up S'mores will melt-in-your- mouth and bring you back to your childhood. You will also love my cream cheese pumpkins with cranberry chipotle sauce.